I have been researching stories of ghosts and legends in the area for over 45 years; indeed it was my own letter to a local newspaper in which I detailed a sighting of my own in 1969 which was to inadvertently spark off the vampire hysteria. I described seeing a ghost-like figure through the cemetery gates one night, and within months this had been distorted into a full-blown bloodsucking vampire with which it would forever be confused. This media manipulation was engineered by certain people with no interest in genuine paranormal research, but a very shrewd awareness of the vampire ‘pound’ which was such a lucrative form of currency for freelance journalists and publicity seekers back then – and to the present day. While Farrant's letter may have "inadvertently" assisted the propagation of the Highgate Vampire legend, Farrant's far from the backseat driver he makes himself out to be. As to "media manipulation", it's true many issues were misrepresented by the press—but Farrant could just as easily be talking about himself. Even the number of sightings has been distorted—"three occasions", not "one night". 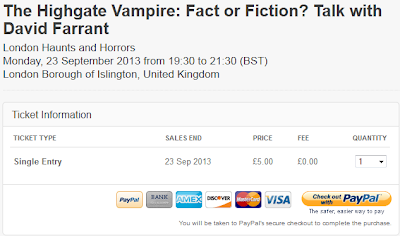 Second, it didn't take "months" for Farrant's ghost to morph into a vampire. Within three weeks of the letter's publication, Sean Manchester, representing himself as the President of the British Occult Society, proclaimed that the ghost seen about the cemetery was actually a vampire in the Count Dracula mould; a "King Vampire of the Undead, originally a nobleman who dabbled in black magic in medieval Wallachia". Manchester's theory was published as the Hampstead & Highgate Express's 27 February 1970 cover story, "Does a Wampyr Walk in Highgate?" "Several other foxes have also been found dead in the cemetery," he said at his home in Priestwood Mansions, Archway Road, Highgate. "The odd thing is there was no outward sign of how they died. These comments were apparently made to "humour some over-zealous reporter". If his "ghost-like figure" had been "distorted" into a vampire, Farrant was clearly a willing participant. Sandra Harris: Did you get any feeling from it? Did you feel that it was evil? David Farrant: Yes, I did feel it was evil because the last time I actually saw its face, and it looked like it had been dead for a long time. Sandra Harris: What do you mean by that? David Farrant: Well, I mean it certainly wasn’t human. Shortly afterward, mail order clerk, Barry Edwards, 24, stepped forward saying he was the vampire people had been searching for. His role as a vampire—in an amateur film for the Hellfire Film Club—had apparently triggered the sightings (Hampstead & Highgate Express, 20 March 1970, p. 1). After Edwards' claim—disputed by Manchester and Farrant—coverage of the case died down. That is, until 7 August 1970, when evidence of tomb desecration and Satanic ceremonies was covered in another front page story by the Hampstead & Highgate Express. 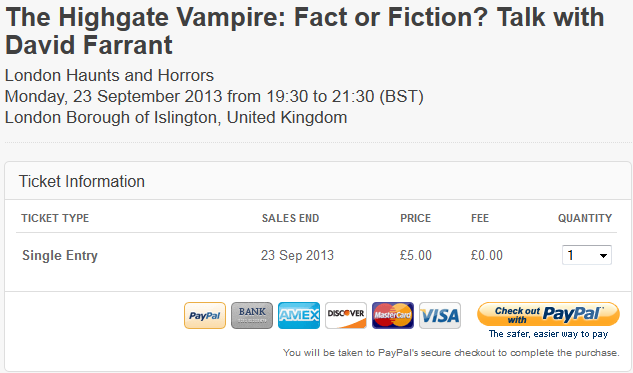 On the night of August 17, Farrant was arrested, apparently with the intent to hunt the vampire. The case was trialled at Clerkenwell, but Farrant was acquitted on September 29. David Farrant: We have been keeping watch in the cemetery for … [pauses] … since my court case ended, and we still found signs of their ceremonies. Laurence Picethly: Have you ever seen this vampire? David Farrant: I have seen it, yes. I saw it last February, and saw it on two occasions. Laurence Picethly: What was it like? David Farrant: It took the form of a tall, grey figure, and it … [pauses] … seemed to glide off the path without making any noise. The following day, the Evening News published Barry Simmons' story, "Midnight Vigil for the Highgate Vampire." Once again, Farrant romped about the cemetery, armed with cross and stake: "David, 24, was all set, kitted out with all the gear required by an self-respecting vampire hunter. Clutched under his arm, in a Sainsbury's carrier bag, he held the tools of his trade." In light of these shenanigans, what should we make of Farrant's statement that "media manipulation was engineered by certain people with no interest in genuine paranormal research, but a very shrewd awareness of the vampire ‘pound’ which was such a lucrative form of currency for freelance journalists and publicity seekers back then – and to the present day"? The worst I did was to go along with another person's innane wild assertions about a 'blood-sucking vampire', but again, this was only because this was the 'angle' the Press and television wanted at the time - 'vampires' apparently selling more newspapers or attracting more interested audiences for TV. The Spooky Isles article, itself, was obviously written to promote an upcoming talk for London Haunts and Horrors as attested in its postscript. The talk's subject? While Farrant might lament his association with the Highgate Vampire case, as he recently did after giving a talk at the Association for the Scientific Study of Anomalous Phenomena's Seriously Strange Conference—"Unfortunately, the Highgate ‘vampire’ case being so complicated time seemed to slip by so quickly, and there was only time left for two questions at the end"—it's facetious and duplicitous to castigate "freelance journalists and publicity seekers" for chasing the "vampire 'pound'", when he's clearly been doing the same thing for several decades. Don't get me wrong, though. I've got no issue with Farrant wanting to turn a quid off the thing or enhance his own publicity through it. But at least be honest about it. Don't pass the buck onto others while holding your own hand out, too. Don't bite the hand that feeds. For several years, Manchester and his sockpuppets have discussed a supposedly incriminating tape in their possession, featuring a discussion between David Farrant and Anthony Arthur "Tony" Hill. It apparently captured Farrant's intent to hoax a ghost story for the local press. Shortly after covering the controversy on this blog, I confronted Farrant with the claim. He stated that the allegations were untrue, and apparently concocted as revenge for Farrant discussing Hill and Manchester's intent to hoax a vampire story for the press—the one that became the Highgate Vampire case. Considering the magnitude of this allegation, I've wondered why Manchester—or his sockpuppets—have never released the tapes. It'd blow the lid right off their archnemesis, Farrant's, claims and vindicate their frequent, extensive, repetitious and negative commentary about him. To that effect, I also told them to put their money where their mouth was. Many readers here will be aware of a vindictive claim being desperately circulated on the Internet by a very mentally disturbed person masquerading as a ‘bishop’ and a ‘vampire hunter’ (and who is widely known by the nickname ‘Bonky’ [Farrant's nickname for Sean Manchester] by his friends and enemies alike), that I hoaxed the Highgate Vampire story back in 1970. The fake story being put around by this bonky individual is, that I colluded with one [Anthony] Arthur “Eggmanne” Hill (a close friend and associate of this bonky person) to invent this vampire story and he (the ‘bonky one’) was given a tape recording of myself (secretly recorded by Hill) which could prove this allegation. Well, despite being challenged by many and various people to publish this tape (or tapes) and do just this, the ‘Bonky one’ has declined to do so. Why? - one can only ask! Could it be that this is because this tape simply does not exist? Or if there exists such a tape its content is entirely different from the falsified interpretation being circulated by ‘Bonky’? People will have to make their own minds up about that if – or when – this alleged recording is ever released. I have no objection to its release. Indeed, I welcome it…But I fear that the only person it could incriminate is the very person who is now admitting to having such a recording. So, Farrant's given his approval for the public release of these alleged recordings. The ball's in Manchester—and his sockpuppet's—court. If they still refuse to release the recordings despite permission being granted, they should immediately retract their claim, apologise, stop promoting it on various blogs and blog comments, and get off Farrant's back about it.